The 16 racial justice organizations that are currently part of Akonadi Foundation’s Arc Toward Justice Fund (ATJ) are building collective power to shape the policies and systems that affect communities of color in Oakland. We are lifting up the work of our ATJ grantees through our monthly spotlight series; for our August installment, we feature two of our grant partners: Gender and Sexualities Alliance Network (GSA Network) and Legal Services for Prisoners with Children(LSPC). We spoke with GSA Network’s Michelle Guevara & LSPC’s Azadeh Zohrabi about their organizations’ work in Oakland. Q: What is the vision that guides your work? What will the world – and specifically Oakland – look like if you succeed? Legal Services for Prisoners with Children (LSPC) organizes communities affected by the criminal justice system and advocates to release incarcerated people, restore human and civil rights for currently and formerly incarcerated people, and reunite families and communities. We work toward creating a world where people aren’t systematically criminalized, imprisoned, and killed within their communities. We’re working with formerly incarcerated people and their families to create healthy communities that are full of opportunity and hope. Develop movement-building capacity at the intersection of LGBTQ+ youth organizing and racial, gender, and educational justice to end school pushout and prevent the criminalization of youth of color. Create a pipeline of LGBTQ+ youth leaders of color who can lead their own movement. When we achieve these goals, we will see school climates in Oakland Unified School District transformed to address the school discipline policies that disproportionately affect LGBTQ+ youth of color and push them out of school and into the criminal justice system. Youth in Oakland will have a strong framework for analyzing racial justice and the intersectionality of systems of oppression so that they can organize, advocate, and mobilize to improve school climates for youth of color locally and on a broader level. Q: What campaigns are you currently working on? In addition to correspondence with hundreds of people in prison and legal trainings we conduct with attorneys and incarcerated parents, we have been busy with campaigns that include litigation, policy, and leadership development. We are currently supporting AB1008, a bill that builds on over a decade of work that All of Us or None has led nationally. AB 1008 would prohibit private employers from asking about prior convictions on job applications – creating a fair chance and opportunity for Californians with prior convictions. We are gearing up to expand our Family Unity Project next year. We will be working with other organizations to develop a Family Bill of Rights and a policy agenda that advances a family-centered approach to ending mass incarceration. Our campaigns focus on engaging LGBTQ+ youth of color to advocate for reforms to school discipline policies that disproportionately push LGBTQ+ students of color and low-income students out of school and into the criminal justice system. 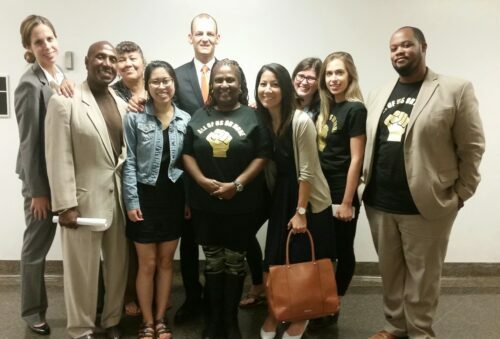 We will also be focused on Dignity in Schools Bay Area, a coalition that includes other Akonadi grantee partners such as Black Organizing Project and Public Counsel, to analyze movement-building issues related to improving discipline policies and practices in schools. We will closely monitor the implementation of a memorandum of understanding around willful defiance in the Oakland Unified School District that includes resource allocation for restorative justice practices in schools. In 2016, with organizational partners like Californians for Justice and co-hosted Free Our Dreams, we launched the Youth Organizing Network; it will serve as a shared platform for racial and gender justice across the state. Q: What will you be focused on for the rest of the year? Like many other Bay Area non-profits, we are being displaced from the rapidly changing San Francisco neighborhood we’ve called home for the past 15 years. We’ve decided to move to Oakland next year and are in the process of purchasing a building. In anticipation of our move we’re investing more time in learning about our new community, particularly the young people in Oakland. We’ve been holding All of Us or None meetings in West Oakland for several months. In July, we held a community event at United Roots where we surveyed some 30 young people about their needs and experiences. We’re planning a similar event with our partners at CURYJ. This information will help us create programs and services that will respond to the needs of young people in Oakland. 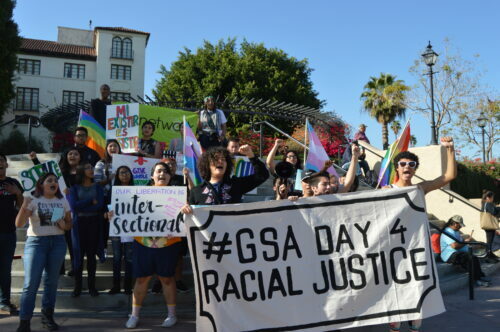 In addition to our ongoing work with Dignity in Schools Bay Area and Youth Organizing Network coalitions, we will continue to monitor the impact of the current political climate on the lives of LGBTQ+ youth and youth of color in schools and assess how GSA clubs can serve as safe spaces and hubs for youth organizing to improve school climate. Akonadi Foundation strives to eliminate structural racism that lies at the heart of inequity in the United States. We work towards a racially just society by funding organizations and leaders fighting on the ground through grassroots organizing, culture shift and policy change. Find out more about Akonadi Foundation’s Arc Toward Justice Grant Partners here. Recent staff trip to Sacramento Photo credit: LSPC / All of Us or None.